Director M. Rajesh has completed the shooting of his comeback film ‘Vasuvum Saravananum Onna Padichavanga’ starring Arya, Tamanaah, Santhanam, Banu, Karunakaran and Vishal in a special appearance. Music is by D. Imman. Vasuvum Saravananum Onna Padichavanga is nearing completion and may hit the screens any time soon. Arya is busy with director Rajesh’s film Vasuvum Saravananum Onna Padichavanga (VSOP) and the film is fast reaching the finish line. Dubbing is currently going on and looks like Rajesh is getting the best out of Arya by demanding more voice modulation and the actor took to Twitter to jocularly express his feelings, sarcastically.. Earlier, speaking about this rom-com, Arya has said that it will be another Boss Engira Bhaskaran in his career. He went on to add that Santhanam is the hero in VSOP while he is the comedian! Well, a statement such as this coming from a bankable hero like Arya is surprising! But the star has a reason to make such a comment as Santhanam had said earlier it is boring to play a hero’s friend all the time and would take up only hero roles in the future. Known to be close buddies, Arya comment has surprised the movie buffs. The star went on to remark that his comments reflect Santhanam’s decision to play the hero henceforth and don the comedian roles only for close friends. 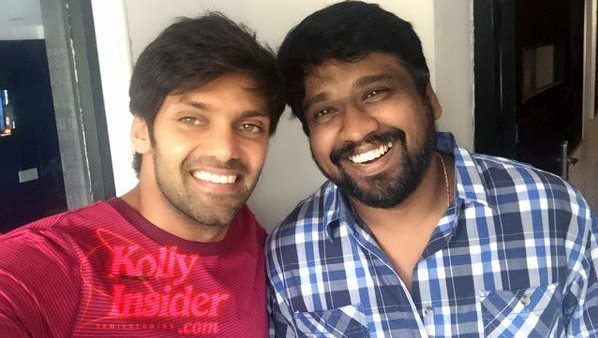 Arya and Santhanam’s comedy in Boss Engira Bhaskaran is an all-time hit and the former went on to add the VSOP will be another BEB, if not, more.